Tools for analyze Facebook and other ads. Some of them are free some not. Below you find some tutorials on how to use them. Educate yourself on how to make perfect ads which will sell. Because it is about the business! http://swiped.co/ See the video below for its performance. See the tutorial from Mike about this tool. Miles Beckler talks about this tool here and Vishal is here. http://www.socialadstool.com/ It doesn’t directly let you view ads from your competitors ( you have other tools for this above) but let you modify the delivery of your Facebook Ads based on your competitor’s spending activity. http://www.adsviser2.io go from money eating maching to money making machine with this tool. Costs: $67/month – $197/year. http://www.adfox.io/ this is database of over 300,000 ads and growing, it helps you find the Best Facebook Ads and Funnels. Costs: $39 – $67/month. 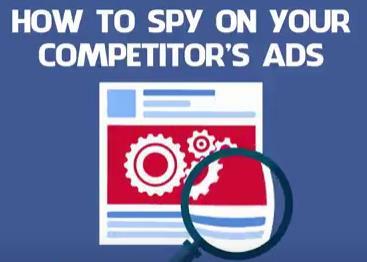 SPY on Your Competitors Facebook Ads? 4 FREE Tools you can use. Be part of your competitor’s marketing funnel and/or sales funnel so you can see how they are generating their customers via ads and to what type of landing page they use. This video is made by vishal kalia look at his Channel for more vital tutorials. learn to understand your competitors strategy behind their ads and copy writing. Also split between the ttime they are in business. so you can see different stages of evolution. There is a difference between people who are many years in business and the ones that are some years doing it. Search for about 5 competitors in each of your chosen categories and see the types of ads they are running. With this information you have examples of different competitors. One may stress brand name others on the product others on the benefit. Got to their website too, and if they are good marketers, they will drop a pixel on your browser and you will receive the ad on FB from them. All this is invaluable information for you. Dont forget to save them in order to have them in your collection for your evaluation. Also click on these ads in order to get in their funnnel and see what kind of „problem“ they address or what kind of solution they offer. See what kind of offer they give like OTO (one time offer) -free shipping- and so on. By the way this might also be a good research for dropshipping business. If you are clever you know the whole strategy from your competitor starting from Ad to optin – sales page – Email funnel – offer – problem solution – texting – design and start reverse-engeneer the whole for your niche. Adespresso look for „dektop newsfeed“ skip the right column because no one is realy looking at that. This is a good descripttion of the tool and how to use it to get best results. https://moat.com/ lookt here for the tool direct if you want quick accesss. This tool gives you a much broader overview not only on Facebook but the whole gamut of advertising of the brand, product or niche. Good tool to get inspiration. http://swiped.co/ There is much more than Facebook Ads, there also Emails and other kind of ads. And the ads are analysed so you can get a deeper insight in the purpose of these ads. This is another Video from Mike. Make sure you check his channel he has a lot of useful information. In this tutorial he explanes how to find the best and successful facebook ads. It can become tough to find the right ad-design. Many compaynies invest a lot of money in order to set the right ad. Check out how to write good headlines (it is in german from Pascal Feyh). Here are some great resources you cann use in order to get into the frame of mind of the best marketers in the field. All you have to do in order to look at some hig performing ads to use these tools. Type in the names, niches, professions and subjects you are interested in and they will show up. Play around and find ideas. Also klick on the ads shown and follow their sales funnel. There is a lot you can learn from them. The only downside of the free version is, that they only give you 5 versions. When you check the ads also look how many shares and likes they have. That will give you some clue of its relevance. And as adviced before, go into their sales funnel and learn how they do it in order to get ideas how to do it yourself. Look for Russel Brunson and look at his ads and see what he is doing. A very good and professional ad costs a ton of money. And here you can learn how these pro ads look like. If you find some matchin ad for your product go on to fiverr oder upwork and get something similar. This tool is not only FB ads gallery, but many other formats too. Go there and filter some niches, subjects and so forth. Also good for MLM. There are also Emails! You can use FB itself. go into your Newsfeed and look for ads. Than click on the little arrow on the right upper corner where it says: „why I am getting this ad?“ Here you can also analyze how the target you and you can find out how they target the audience. Great way to get information. If you have someone you like or is in a specific business area you like or is your competitor, go out an see if they are running some ads and study them like their page and enter to their funnel in order to get the information you need to make your business as successful as theirs.